For the last 6 years, I have been incorporating at least one "pop" song into my 5th and 6th grade choir's performances at every concert. 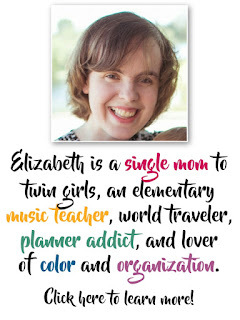 I have found it to be a great practice for so many reasons, and over the years I have learned how to make it work most successfully for my students. Today I want to share some of the benefits I see, and how I use the songs in a choral setting. Engagement: I readily admit this was the #1 reason I started looking for ways to include pop music initially. I have two pull-out/ optional choirs at my current school: one for 3rd and 4th grade, and one for 5th and 6th grade. I found that there was a significant drop off in interest/ enrollment in the upper grades, because many felt they had already "been there, done that". I save the pop songs for my 5th and 6th grade choir, which gives them something to look forward to and helps the class feel different from what they did in 3rd and 4th grade. Parallel Harmony: This is a natural way to work on students' ability to learn and perform parallel harmony parts by ear. Because many of them are familiar with the song already, many students find it easier to hear the chords/ harmony lines. For students who are just starting to learn to sing parallel harmony, this is an excellent entry point! Solo Opportunities: One of the other ways I distinguish my upper grades choir from the lower grades choir is by offering opportunities for solos only in the upper grades. Pop songs are usually where these solos are included, and they are a natural place to include them! I find students are generally more eager to audition for these solo parts as well, because they are more confident on the pop songs and because there is an increased "cool factor". Singing Styles: Different genres call for different styles of singing, and including pop songs in our choral literature provides an opportunity to work on a more pop-style of singing. I find including this style in what we learn makes it easier to encourage students to then practice singing in a more traditionally choral/ art music style as well, and in truth, the majority of my students are more likely to find use for pop-style singing in their adult lives anyway! Expression: Pop music (if chosen properly) is one of the best ways to get students this age to work on expressive performance and communicating a message through their song. 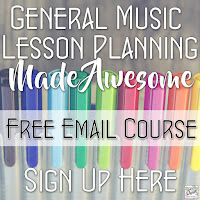 The right pop song can connect with students' emotions in a way that few art songs/ traditional choral pieces can, so this is a great opportunity to work on communicating those emotions and messages through their performance. Parallel Harmony: I tend to add a harmony line on the chorus and keep the verses in unison. Sometimes there will be section(s) that already have a harmony singing part in the original recording- sometimes I use the same lines, but often I don't. My main consideration of course is vocal range, so I often end up adding my own harmony line. Simplified Runs: Over the years of doing this I've moved more and more away from simplifying rhythms and melodic lines too much in an effort to make it more "choral"- I find students think it sounds too childish, and often end up more confused anyway- but I do find ways to simplify or remove vocal runs and ornamental notes. Sometimes I do this by making a section with lots of runs into a solo, removing the line altogether, or simplifying the line. Include Solos: My standard formula tends to be to have everyone sing the first verse in unison, sing the chorus in parts, and then make the subsequent verses (and sometimes other sections like a bridge) into solos or small ensembles. Partner Singing: Obviously this doesn't work in many songs, but there have been a few times when a song will have 2 sections with the same chord progressions that work together well so I can have them sing the two sections as a partner song. It is a great way to increase the difficulty, add some musical interest if a section is repeated a lot in a song, and incorporate more choral skill-building! Remove Sections: Sometimes there will be just one section of the song that doesn't work for elementary choir for one reason or another. In that case I have sometimes removed the section altogether or replaced it with another one from a different part of the song. Accompaniment: Sometimes there is a great arrangement already written for choir, but I rarely use those- I find these arrangements usually take out too much of the stylistic elements and defeat the purpose of including pop music in the first place! I am often able to get "karaoke" tracks to use, or depending on the song, I have also been lucky enough to have live instrumentalists play with the choir sometimes as well. 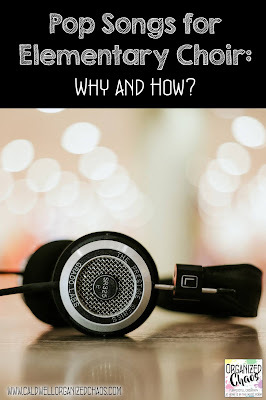 You can read about my criteria for selecting pop songs, how I find them, as well as some examples of songs I have used successfully in the past few years in this follow-up post. For now I'd love to know: what are your thoughts on using pop songs with elementary choir? Have you ever done pop songs with your own choirs? What questions, ideas, and suggestions do you have? I'd love to hear from you and chat with you in the comments below. Thank you for posting this! 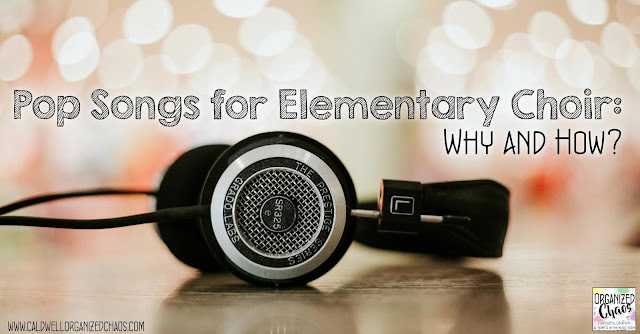 My background is very traditionally choral trained and so when I stepped into leading the choir at my school I had a hard time finding songs that the kids were engaged in and were musically rich. I've now included at least 2 per season and the kids just love them so much! I've had to re-frame for myself what is "appropriate" reperatoire for my choir after seeing how much joy my students exude in singing more pop-style songs. Thanks so much for commenting! We're all learning and unlearning- I only did traditional choral pieces with my choirs when I first started teaching as well. And when I first started using pop songs I only did it as a "hook" to get more buy-in. I didn't realize at the time how musically rich and challenging it can be to learn pop songs, just like it can be with traditional choral pieces! Will you be getting into specific songs you’ve had success with?